Recently Tsunku revealed the members of a new unit that he is forming within Hello! Project; within this unit we have Miyamato Karin, Takagi Sayuki, Otsuka Aina, Miyazaki Yuka and Kanazawa Tomoko. The unit is currently unnamed and Tsunku has mentioned that there may be changes within the lineup until their official debut. Currently the unit has no name and they will go through an Indies period. This is the first of what will be several units within the Kenshyuusei, Tsunku has revealed. The announcement was only recently made, but I certainly did not jump on the bandwagon like others did; at that point I was taking a break from my blog because of the Minegishi Minami scandal and I was a little bit derailed, I guess. Well, considering the amount of happy news that has appeared, I am feeling a lot happier to blog now! Whoo! Regarding the news, I am ecstatic! More so that a new group has been formed and that Sayuki and Aina are in a unit, but ecstatic none the less! This is wonderful news and also this means that Karin fans can finally put a cork in it when it comes to her 'never being debuted because Tsunku is a prick and wastes talent wah wah wah...' - I know I'm being a cow, but Karin's extreme fans are pretty annoying. Then again, I'm annoying as you all know. Anyway, I am happy because this line-up looks really promising, with Aina, Sayuki and Karin being three strong singers and I am completely happy with who they have chosen. I am surprised that Yuka is in there, but I think her addition will add maturity to the group and also freshness. She is the newest of all the girls as far as I know, and the only one to not be in the Kenshuusei. Hopefully she will do well with the other girls! I am actually looking forward to following this unit through their Indies to their debut (if it happens, which it will cos, like, Karin... duh) because whilst I was there for the S/mileage major debut, I payed very little attention and actually made no commitment to the group until afterwards, so with this group I hope to see them fully blossom and earn their name as a Hello! Project unit. I just hope that they don't end up with the same fate as Up Up Girls; release good stuff but never have a PV. That actually annoys me. Concerning the other groups that Tsunku is thinking of, I hope that he creates a new duo unit and possibly another five nin unit. I would love to see H!P become busy again and possibly even bring in new sub-units, but right now, I am looking forward to what Tsunku is doing with the trainee's. I hope that this unit debuts soon and releases singles for us all to enjoy, and also I would love it if Tsunku kept the line-up this way... the change to S/mileage destroyed the group in a way, so I would love it if this unit stuck to how they are now. Anyway that's all from me for now. If I make no sense, then I apologise. It's just it is 5:22am and I have not slept since my nap. Oh well! Technically I think Kanazawa Tomoko is the newest of them all? 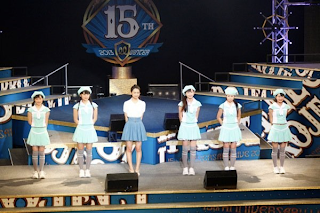 Since she just joined the trainees in December 2012 (where Yuka was already signed and participating in GREEN FIELDS).